What do icy cherry popsicles, sweet grape sodas and sticky banana taffy have in common? “I believe it is more regenerative for the land and I think it benefits rural economies,” one farmer says. What happens when a fusion chef gets tapped by the first family. Climate change might leave a bad taste in your mouth. Literally. We’re learning more about how erratic weather can affect the flavors of our foods. In our search for holiday traditions outside the United States, we came across a Venezuelan staple. It's called hallaca, and it's similar to a Mexican tamale. 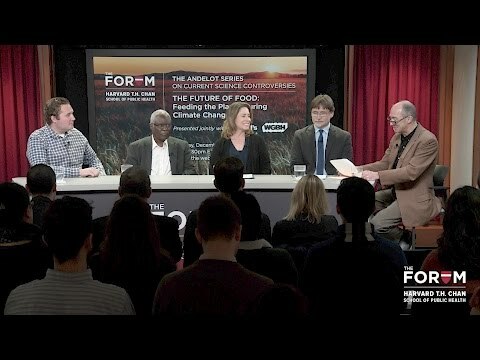 This forum explored innovative methods and systems for producing food, as well as new types of products and underutilized sources. Watch a recording of the conversation here. Conservationists want you to eat more lionfish. Wait, what? Lionfish is a delicacy that’s catching on in restaurants. But in this case, conservationists are begging you to eat your fill. Craving some Koobideh from Iran? Arepas from Venezuela? Head to Pittsburgh’s Conflict Kitchen, where a rotating menu features food from countries in conflict with the United States. Vegetarianism is a norm in India, but most in the country do, in fact, eat meat. For cultures that follow the lunar calendar, today is New Year's Day. Many of us simply refer to it as Chinese New Year. But the truth is that communities in and from places other than China have their own traditions and foods built around the day. The World's environment editor Peter Thomson explores the possibility that climate change may be contributing to the unrest in Egypt. New data this week from the analysis group Hedgeye shows that some of our favorite breakfast items like orange juice and coffee are rising in cost so much that they could be considered "luxury items. " Louise Story joins us for more. For today's Geo Quiz, we're searching for an ocean strait between the North Sea and Kattegat Bay. Denmark lies to the south &mdash; Norway and Sweden, respectively, to the north and east. Annia Ciezadlo explores the relationship between food and war in her new book, "Day of Honey: a Memoir of Food, Love, and War. " A correspondent in Iraq and Lebanon for seven years, Annia Ciezadlo says that preparing meals helped her report. Even during the height of the Sri Lankan civil war, Sinhalese and Tamils were able to come together on a few things. One of those was food. Reporter Ike Sriskandarajah gives us a tour of Sri Lankan cuisine. Anchor Lisa Mullins speaks with Staci Fritz of Ian's Pizza in Madison, Wisconsin, about the solidarity pizzas being delivered to protesters there, courtesy of donors from all around the US and the world. Former Jack Daniels Whiskey master distiller Jimmy Bedford talks to Faith about his 40-year career brewing spirits and why he finally decided to retire.